thinkst Thoughts...: Etsy shows established companies the way..
Etsy shows established companies the way..
Fred Wilson over at AVC.com wrote a piece on the Etsy offices (in 2010) titled: "The office matters"
In it he explained how "They are getting the best talent in NYC to come to their company" and commented on the importance of paying "attention to the office and the culture" of a company. Around the same time I had written a piece titled "Cargo Cult Startups" in which i posited that too many companies were faking startup culture, keeping draconian productivity-killing rules in place while plastering their offices with beanbags and nerf guns. The ad calls for an "Office Hacker" reporting initially to the VP of Engineering. "Our office has tons of data lying around, but our systems to use and understand that data are freakin' horrible. ... usually, though, we never even get around to using our development skills to make our working environment better. We want you to hack our space. 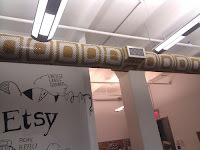 Make the office more fun and interesting and useful for everyone at Etsy, using development as your primary weapon. If you come up with something good, open source it and help save the world. Move between projects easily, but have the discipline to actually get useful stuff done and deployed, and move onto the next thing only after that. Manage your own time and projects, and talk to people here about what they need and how they might build it. Learn from us and teach us." You often walk into corporate offices and see little annoyances of office life, that could be trivially automated away by a determined hacker and a few lines of code. You see a number of broken processes or disconnected loops and you want to shout out "You can write an app for that." It's even more interesting when the workplace is non-generic and requires domain specific knowledge (a Newsroom/Manufacturing floor vs. a regular office gig) because the domain specific knowledge makes it even less likely for generic solutions to exist. Sadly, such apps fall somewhere between the serious in-house dev teams and the internal IT staff and most often most regular staff will never know how easily those problems can be hacked. Startups automatically bypass this, since most startups will probably have the developers, sysadmins and secretarial staff as the same people (for some periods of time). In his post on great hackers, Paul Graham writes: "At our startup we had Robert Morris working as a system administrator. That's like having the Rolling Stones play at a bar mitzvah. You can't hire that kind of talent." In startup cases like that, you have a great amount of brainpower that you can bring to bear on essentially solving problems in the office. While tweeting coffee machines are good for morale, you will just as often manage to uncover hidden gems that give birth to new products or revenue streams via the classic "scratch your own itch" creedo. It's worked really well for some pretty famous companies. I think finding the right hacker will be tough, but recruiting A-players always is. In this case though, i think the payout can be huge. 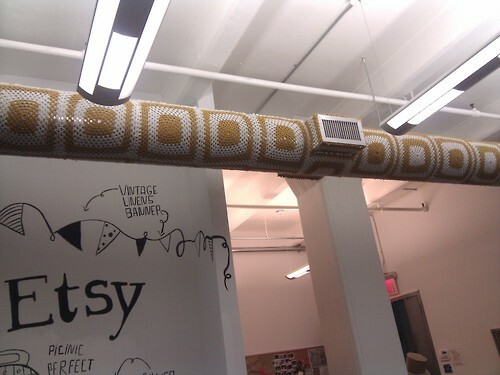 If you are a big company, i can think of many worse ways to spend a headcount than by getting in an Etsy-style "office hacker". Echo your enthusiasm. This is a hugely beneficial thing to have--developer cycles to dispense on short-term, useful projects. You mentioned in-house dev and internal IT teams, and their well-understood limitations. What's still surprising to me (especially in small- to mid-sized orgs) is how shockingly limited software development resources are in internal IT, and how completely all of their cycles are absorbed by internal applications. In-house dev that's housed in an engineering or product group is bound by similar constraints. In the startups that I've been in for which I've run development groups, the approach that I try to take as often as possible is to intensely recruit a small (though ever-changing) group of undergrad interns to use for office hacking. It doesn't always work, but it does more often than not.